Lighting the Darkness—Poetry Friday is Here! Happy Poetry Friday and Happy Almost Winter Solstice! I wish you light and warmth during these short days and long nights of December. 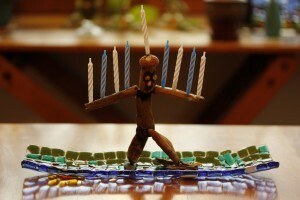 This fall I collected a pocketful of driftwood at Lake Michigan and made a handsome driftwood dude. He climbed atop a mountain of pumpkins to celebrate Thanksgiving. 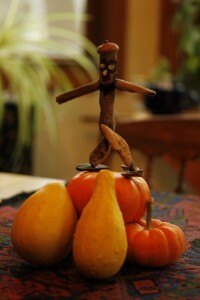 Driftwood dude surfs on pumpkins! 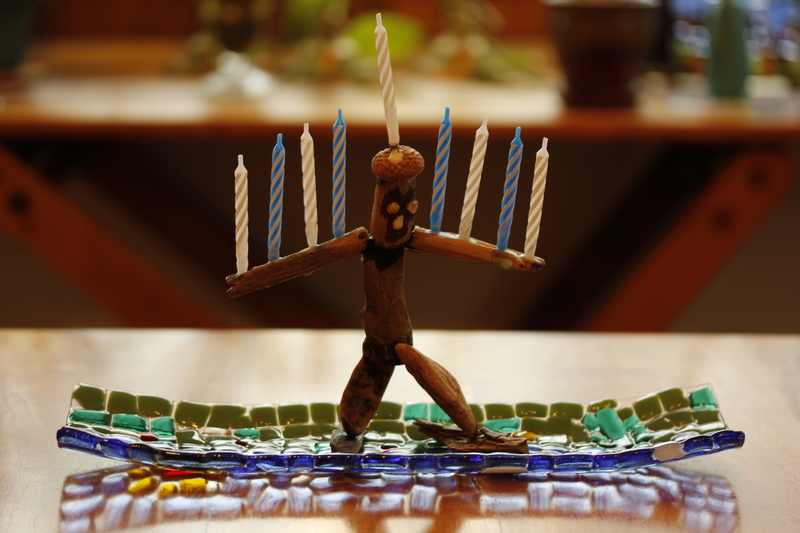 Now that Hanukkah has begun, he’s given up his gourds and donned a cloak of candles and a new super-hero persona–Menorah Man. and lights our Hanukkah display. 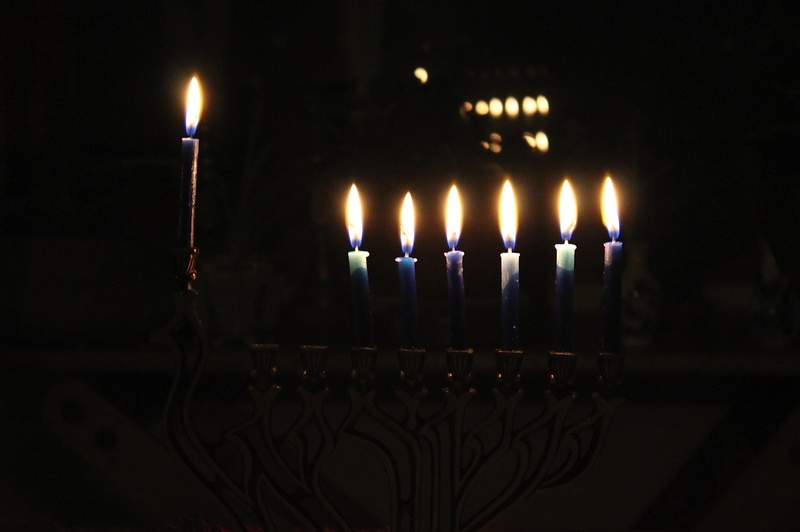 More candles than we’ve had for 2014–tonight is the fourth night of Chanukah. I hope your holiday celebrations shine with light. And if you’re in need of some inspiration and wonder to get you through the dark days of December, read some poetry posts! Please leave your links and I’ll add them during the day. Linda’s sharing a Picture Book Holiday Read-In, complete with holiday music, snacks, and photos of happy readers at Write Time. At Alphabet Soup, Jama’s sharing Roger McGough’s “An Alternative Santa” and some childhood holiday memories as her last post of 2014. Over at Live Your Poem, Irene delves into the darkness and shares poems from the new book POISONED APPLES: Poems for You, My Pretty by Christine Heppermann. At Author Amok, Laura introduces two store-front literary centers in her area that offer writing classes, readings, literary events, youth programming, and, of course, books! As a holiday gift, Laura’s supporting both these centers and telling others how they, too can become a member or make a holiday gift. Robyn (whose cleverness and talents know no bounds) shares a found poem celebrating friendship that she crafted for Christmas at Life on the Deckle Edge. Laura Purdie Salas continues her poetryaction series with two original poems inspired by two picture books illustrated by Laura Dronzek, IT IS NIGHT and MOONLIGHT. Over at The Poem Farm, Amy shares the story of her ever expanding nativity scene. Linda shares a wonderful poem that UA Fanthrope originally wrote for her Christmas card at Teacher Dance. Catherine shares “The Coming of Light” by Mark Strand and Reading to the Core. At My Juicy Little Universe, Heidi muses on this season’s darkness and shares Annie Finch’s Solstice Chant. Margaret shares student poems written in response to Eye of the Storm by Kate Messner, and an Animoto video on A Maze Me by Naomi Shihab Nye. Liz Steinglass offers some excellent holiday picture books that are favorites of her family. Julie Larios is celebrating the news of our reestablishing relationships with Cuba with a video of a serenade sung on the streets of Havana. She also shares a poem from Margarita Engle’s The Surrender Tree: Poems of Cuba’s Struggle for Freedom. Keri shares an original caffeinated haiku at Keri Recommends. It’s a deja vu blogfest over at Mainely Write where Donna reposts “My Wonder,” a poem she wrote in November and brings some light into the night. At All About the Books Janet reviews bees, snails, & peacock tail: patterns & shapes–naturally, written by Betsy Franco and illustrated by Steve Jenkins. Thanks, Janet–this one’s going on my to-read list. Poetry can capture expressions of joy and sorrow. Ruth shares her thoughts about grief this week, and some moving lines about losing a child from King John, by Shakespeare. Over at Beyond Literacy, Carol offers “The Gift of Words,” an original poem accompanied by an image for holiday wondering. At Poetry for Kids Joy shares an original poem with some wonderful photos of the Giant Eland in his grassy home. Mary Lee shares “Barter” by Sara Teasdale, a poem to remind her of life’s goodness in times of craziness at A Year of Reading. The Logonauts shares a bilingual poem called “Me x 2” by Jane Medina, and reviews the book Amazing Faces by Lee Bennett Hopkins, which celebrates diversity in the US. Diane is celebrating the solstice at Random Noodling with some original poems and the poetry swap poem she received from Irene Latham. At Kurious Kitty, Diane shares “Stars” by Sara Teasdale. Jennifer has been writing love poems with her students, and shares her original poem at Teacher Et Cetera. Ramona shares a favorite Christmas poem by Elizabeth Searle Lamb at Pleasures from the Page today. Jone captures the spirit of the season with her nativity poem at Deo Writer. This entry was posted in Uncategorized on December 19, 2014 by Buffy Silverman.